Check out Part One of Coach Steve Rippon’s Pole Vault Clinic. Steve is part of Fast Track Recruiting’s Coach Network. Coach Rippon is among the most respected Pole Vault coaches in the world having coached for several countries including Australia, Finland and the U.K.
Cross Country Training: How To Peak At Your State Meet? I have received several emails and texts recently asking me how to peak at the State Cross Country Championships. Because the State Meet is often the defining factor for your entire season, it is important that you have an understanding of what is required to ensure you are at your best in November. As a college coach, my focus was always on the Conference Championships, Regionals, and the NCAA National Meet. I spent 25+ years trying to perfect the process. Here a few suggestions that will give you the best chance to be at your best when it matters most. 1. Maintain your Long Run throughout the season. Do not let this go. Prioritize it through the month of September and keep it in your training schemes through the month of August. 2. Maintain your mileage. Don’t allow your mileage to drop too much or too often throughout the season. Constantly remind yourself that you are training for the State Meet. Meets in September and early October are ultimately meaningless and quickly forgotten if you don’t run well at States. 3. Keep longer intervals in your training deep into the season. Avoid the temptation of running all of your intervals at significantly faster paces over shorter distances. As the season progresses reduce the quality of your longer intervals and utilize them to maintain your strength. 4. Choose your moments of being “jacked up” wisely. You only have so many times that you are able to dig deep into your emotional well. Don’t waste any of them in September. Don’t waste them on course records or hitting a certain time. Be business like in your approach until it is time to be jacked up! 5. Similarly limit the times to dig deep into your physical well as well. You only have so many bone crushing, heroic performances in you. Never waste one in practice or at a “donkey” meet no one will ever remember. Choose your Herculean moments wisely. 6. Realize that if you line up at your State Meet physically, emotionally and mentally ready to compete that you are worlds ahead of the majority of runners lining up next to you who have spent everything they have weeks ago and find themselves completely fried. I hope this helps and good luck with the remainder of your season. Need help with your off-season winter training? Want to train like Kyle Merber, Johnny Gregorek, Ed Cheserick and numerous other NCAA All- Americans and Olympians? We offer personal coaching – CLICK HERE for more information. Training at altitude is unlike anything I’ve ever experienced. For the first two days in Peru, nobody ran. We just took this time to get used to the lack of air. At this point, I didn’t notice any difference in the air when I was doing daily activities. The next afternoon we went for our first run. Things felt weird. I did 4 miles at about 8-minute mile pace, but I was breathing as I normally would running 6:50s on my easy runs back home. As the trip went on, we began doing some pretty taxing service work throughout the community in Pisac. One day, I spent an entire morning carrying dirt, fertilizer, and roofing up a mountain to help a local farm relocate to a nearby school. I must have made fifteen to twenty trips up and down within a few hours. This was one of the most rewarding things I’ve ever done. We had about twenty people in our group helping out the three or four people who worked the farm. We saved them countless hours of work by coming to help, and it was clear how genuinely grateful they were (I also got an amazing workout out of this, so that never hurts). Our running gradually increased in intensity as well. At about two weeks in, I did an 11 mile run at 7:45 pace, and I was holding back a little bit to stick with the group (I would’ve liked to drop the last 3ish miles closer to 7:15 pace to push myself a little). I was really happy with this run, considering we had only been at altitude for a little over two weeks. There were sometimes when I worried about not getting good enough training. Every run we went on was pretty easy paced, and we only did one or two workouts while I was there. (EDITOR’S NOTE – See Flotrack workout video where CU Buffs legendary Head Cross Country Coach urges his men and women to keep the pace easy on a scheduled long run because the hills and altitude would provide the workout). I was forgetting that just sleeping at 10,000ft is good training for your body. I was more worried going into our last week of the trip because we weren’t really going to have the chance to run at all during our four- day trek to Machu Picchu. I thought I was missing out on four days of training, but I couldn’t have been more wrong. Over the course of four days, we covered about 50 miles, reaching a high point of 15,300 feet above sea level. We climbed up and over multiple mountains, and my legs were absolutely destroyed from so much walking. (EDITOR’S NOTE – Most Elite Kenyan runners include long walks into their early training phases. It is not untypical for Kenyan runners to conduct three long walks of over 2 hours in duration into their early season conditioning programs). I don’t think I’ll be having much trouble with hills this cross country season after this experience. Traveling to get back home was tiring. I took a bus and four planes to get home over the course of about 22 hours. As one would expect, I was very tired when I finally got to my house. I had a good dinner with my family and got some energy back, so I decided to go for a little shake out run that night. This is when I noticed the effects of being at altitude. My legs didn't feel great, but my three-mile run felt easy at 6:35 pace. It’s incredible how much air there is closer to sea level. It was almost as if I was taking in something that I didn’t know was there. It just felt good to be going a little faster again. This experience has taught me so much about myself, running, and life as a whole. Spending three weeks practicing another language, getting to know local market workers and their children, immersing myself in another culture, and making new lifelong friends is something I’ll be forever grateful for. I’m excited to use this knowledge to reach new heights on the cross country course this year. Thank you, Peru. 1. Stay with what got you there – remain consistent. 3. Don’t press - stay controlled and comfortable during quality work. 4. Communicate with your coach about everything. Sunday – 9 miles @ 6:20 pace. Slower than usual but getting ready for States. Monday – 6 miles @ 6:23 pace + 4 x 150m in 20-21. Smooth and relaxed run with coach. Wednesday – 6 miles @ 6:24 pace + 4 x 150m in 20-21. Slowly drawing back on intensity, but keeping mileage consistent. I felt very relaxed. Thursday – 1.5 mile warm up +8 x 200m in 29 – 1.5 mile cool-down. I spiked up for this one. This workout was the easiest I have felt all week. Friday – 4 miles at 6:49 pace at 7:00 am to get as much rest as possible before tomorrow + 4 x 150m in 20-21. Sunday – 6 miles @ 6:21 pace. Staying consistent with what we have been doing to get ready for the national meet. Kept things pretty chill – no long run this week as my coach and I decided not to consider mileage this week at all. We decided to supplement harder workouts for missed mileage. Monday – 1.5 mile easy + 400m in 58, 2 x 300m in 44, 600m in 1:28 – 800m recovery jog – 4 x 200m in 26-27 – 1.5 mile cool down. Overall this was a great day for me and a confidence booster going into the weekend. I felt comfortable and controlled! Tuesday – 6 miles @ 6:11 pace + 4 x 150m in 20-21. Pretty easy day. Wednesday – 1.5 mile warm-up -8 x 200m in 29 – 1.5 mile cool-down. This is basically my go to tune-up before big races (see above). Felt great, other than it being so hot out. Thursday – 4 miles @ 6:40 pace . Nice jog with some friends out in Seattle – a lot of talking and laughing. Followed run with 4 x 150m. Derrick Adkins – 1996 Olympic Gold Medalist. “Shatter the glass”. Over the course of my career, I have had the pleasure to work with many amazing coaches and athletes. Among the coaches, I worked with are 1996 Olympic 400IH Gold Medalist, Derrick Adkins and sub-4 miler, Elliott Blount. During their running careers, both possessed successful means and tricks of the trade to overcome performance related anxieties. Through the affirmation of a seemingly simple statement and training of the mind, the athletes they worked with were able to calm themselves to a level that would allow them to compete at their highest level of potential, assuming they were physically ready. As the most important meets of the season draw near – try these two simple proven strategies to optimize your performance. Coach Derrick Adkins would encourage his athletes to visualize each specific anxiety-causing factor. He would have his athletes visualize placing each of these thoughts on to a large piece of glass. When all of the negative thoughts and anxieties were placed upon the imagined glass, he encouraged his runners to “shatter the glass”, allowing them to watch their anxieties crumble apart and fall to the ground. On many occasions, I often overheard Coach Blount to tell his athletes to, “visualize the movement”. This mental exercise simply entails focusing your mind energy and attention on the correct execution of the required movement at hand. This allows the athlete to focus on what is physically required of them, pushing out the worries and fears of unknown arbitrarily identified and hoped for outcomes. At this point of the season, you have done all that you are physically capable of to ready yourself for optimal performance. To fully actualize your potential be sure to ensure that you and your mind are on the same team. "Hey, Coach - Any Tips for Breaking 50 in the 400m"
I was recently contacted by a current high school senior who is stuck at 51 in the 400m. His goal for this season is to break 50.00! He wrote me asking for a few tips. I have three suggestions for you if you want to PR in the 400m or break 50! TIP ONE - Run hills. Hill training in the early season will significantly increase your finishing speed/strength over the last 100m of the race. Several years ago, the University of Minnesota had two different men run 44. They were both local Minnesota HS runners with modest HS pr's. I was so intrigued by their development that I collected all of their training information from their coach. They did hill workouts twice a week in the early season and continued them deep into the outdoor season. One of my favorite hill workouts is to run 6- 8 x 150m-250m hills with a walk down recovery.. Take 5 minutes or so to recover and then find a 500m hill to sprint up with all you have left. TIP TWO - Incorporate Aerobic Strength work into your training. There are many ways to achieve this goal without having to become a cross country runner. A few of my favorite aerobic strength workouts include 3 x 5 minute runs at a quick tempo with 3 minutes rest, 10-12 x 100m in 14-15 with 45 seconds rest and multiple sets of diagonals on the track. For more information on how to run diagonals see here: http://www.sweatelite.co/david-rudisha-key-workouts-diagonals/ - I would suggest working up to 6 sets of 3 diagonals with a 3 minute rest in between sets. TIP THREE - Run split intervals with short recovery to prepare your body for the late stages of the race. My favorite specific prep workouts are 2 sets of 2 x 200m at goal race pace with 30 - 45 seconds recovery (you should take 10-15 minutes before starting your second set) and 2 x 300m - 200m with 45 seconds rest. Run the 300m controlled, but fast enough to get you tired (aorund 45 seconds for a 50-second 400m runner) and then run your 200m as fast as you are able. Routine easy runs of 50 - 70 minutes at a comfortable pace. Staying motivated during this time of the year can be one of the most challenging parts of training. Our last 2 posts were about the cold weather and cross training, in addition, many of you are coming up on midterm exams. Life will happen, there will always be other things to manage and working through these things on top of your running, requires maintaining focus and motivation. The starting point, the launch spot, the beginning of becoming and staying motivated is to identify what you are trying to achieve. On the first night of camp, Coach McCaff, sat you down and asked you all to write down our goals for the Cross Country season ahead. How many of you have done this for the Indoor season? If not, the time is now. What are you going to do today, tomorrow, next week in order to be where you want to be, a month from now, a year from now, 5 years from now? The more of life I live, the more I realize success comes to those who are able to maintain motivation and passion. Honing your direction and refusing to be thrown off track in your pursuit is essential to success. This requires you to remind yourself daily of the purpose behind what you are doing.This means staying awake to your goals. Post them where you can see them. Make your goal time the passcode to your phone.Your background the track you’ll be racing that next big meet on. Maintaining motivation is hard, but the best, they build through the tougher times and come out on the other side. Day by day, task by task. Building, always building. Always Staying awake to the necessary work. Coach Rebeka Stowe is a New Jersey transplant. She competed in high school and college in Kansas before moving to New Jersey in 2013 to continue her athletic pursuits with the New Jersey-New York Track Club. In high school, she was a multi-sport athlete and two-time state runner-up in cross-country. Upon graduating from Olathe Northwest High School in 2008, she competed for the University of Kansas finding her niche in the Steeplechase. While at Kansas she was a three-time all-American, school record holder and 2012 Olympic Trials Finalist in the Steeplechase. 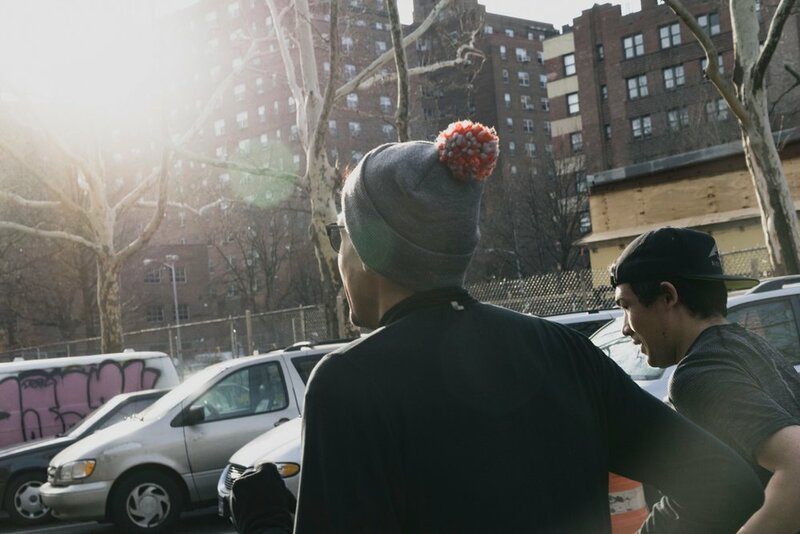 Coach Stowe is currently coaching at The Wilberforce School & with Nike+ Run Club in NYC. She continues to pursue her professional running career. "Hey, Coach - Any Tips for Breaking 2:00 in the 800m"
I was recently asked by a sixteen-year-old high school runner who is stuck at 2:01 in the 800m. His goal for this season is to break 2:00! He wrote me asking for a few tips. I have three suggestions for you if you want to PR in the 800m or break 2:00! TIP ONE - Run hills. Hill training will significantly increase your finishing speed/strength over the last 150m of the race. My favorite hill workout is to run 8 - 10 x 150m hills with a jog down recovery. The goal of this part of the workout is to conclude finish as quickly as possible - so you'll have to hammer the downhill as well. Take 5 minutes or so to recover and then find a 600m hill to sprint up with all you have left. TIP TWO - Incorporate Lane 8 Tempo's into your training. This is a far more fitting manner to get in tempo/threshold work for an 800m runner as it breaks the run up into 400m segments and allows the 800m runner to perform this at a faster pace than if you had them do a standard 3 - 4 mile tempo run. TIP THREE - My favorite sharpening workout is 600m- 400m- 200m- 200m. The goal is to rest as little as possible. During this workout, we just get after it. The 600m should be around goal pace or slightly faster. The 400m should be at the same pace (this will be very difficult to accomplish). The 200m's should be a pace slightly faster than the 400m. Although the stated goal is minimal rest - you don't want the quality to suffer! You may have to rest 10 - 12 minutes after the 600m. Kyle Merber - Ten Years After His Win At Millrose! Kyle Merber jogs lightly under the stands at Madison Square Garden. He’s 17 years old, a senior at Half Hollow Hills West High. As a native New Yorker, a kid from Long Island, he’s been here plenty of times before, but on every previous visit he’s gazed down on the arena floor to find a hockey rink or a basketball court— Rangers or Knicks. Maybe a circus or a concert stage. But tonight, the self-described track nerd peers down the concourse walkways, through the gaps in the stadium scaffolding, blinks past the overwhelming arena lights, and sees a track. A beautiful, historic, 11-laps-to-the-mile oval. Even the sight of the Mondo surface sets his heart beating faster. He’s run on plenty of tracks before, but never this one. 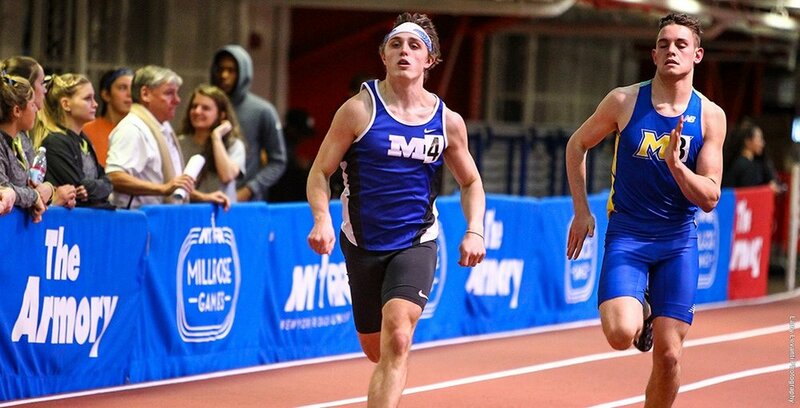 Never at Millrose, where you have to be invited, where the high school milers compete in the same meet as the professionals. And now, deep in the bowels of this venerable arena, he’s preparing for that race. Maybe the biggest race of his young life. He's been keeping a journal of his preparation for DyeStat.com, a Web site where — if he’s honest — he probably spends too much time, especially on the message board known as The Playground, where he goes by the handle: g2g4gold. He agreed to participate in the blog — called the Road to Millrose — before he’d even qualified for the meet, which seemed like a reach, possibly hubristic, but it worked out. Lots of things have worked out this season. He’s put in the miles and pursued his goals and taken care of the small things. All the stretches and striders and nutritional choices. The habits that provide the advantages someone needs in order to qualify for a race like this. That’s Kyle Merber at 17. He had run in another invitational mile a week earlier in Massachusetts, the Reebok Boston Indoor Games. There, he found himself in the most competitive high school field he’d ever faced, dropped a three-second PR, and didn’t come close to winning, but the highlight might have been meeting Australian distance star Craig Mottram. Kyle and some of the other high schoolers called Mottram’s room at the event hotel, got his autograph and peppered him with questions. And now, in the cramped warm-up room at the Garden, there’s Mottram again. Bernard Lagat and Nick Willis and Galen Rupp. All of them, somehow more human and more imposing in person. Kyle observes their routines, absorbs their preparations, admires their kits, covets their spikes. Files away the small things. The manner in which these stars ready themselves for the same 11-lap contest he’ll be running against fellow teenagers. In a few minutes, he and the other prep invitees will burst into the glare of the lights. Kyle will bounce through a quick lap on the track, finding his friends and family in the crowd, hearing the hometown cheers, the shouts of G2G4GOLD! aimed at the kid from The Playground. The only kid from New York. When the gun goes off, he’ll block out everything — the noise and the fans and the rumble of the feet on the track — and focus on staying in contact. He’ll handle the elbows and cover the moves and notice the pain and keep an eye on Robby Andrews and his notorious kick. He’ll make a bid for glory with two laps to go, and hope it sticks. On the homestretch, he’ll sense daylight and dig deeper. Lanky legs in full stride. Crowd thundering to its feet. Steps from the line, his face will be all joy. The celebration, poster-ready. An expression caught between a gasp and a grin. Arms spread wide, finish tape about to be reduced to tatters, fingers pointing to the cheap seats, the nose bleeds, the rafters. Letting all the hometown fans know what place their boy is about to finish. In this race. In New York. On national television. Kyle will stagger in a half circle, extend his palms in salute to the roaring fans, allow his forearms to fall languidly over his head. Still struggling to comprehend his accomplishment. Are you wondering how your times stack up compared to performance on other indoor tracks? The NCAA has a conversion chart based on years of data collection to create a more equitable look at performance. The configuration of an outdoor track and field running facility has been standardized in the size (overall circumference) of the oval for a long time, with very little departure from this standard. While there is a standard for the size of an indoor track and field running facility, many indoor running facilities were designed to fit into existing buildings; therefore, there are many variations of sizes for indoor track facilities. Varying facility configurations produces inequalities in performances, which affects the goal of valid comparisons among event performances. These inequalities are the reason why conversion differentials, dependent on facility configuration, were developed for qualifying standards. The NCAA converts all times produced on a flat track to a banked track equivalent to ensure fairness. See below an estimated conversion chart that will allow you to covert your time on a flat track to the equivalent banked track performance. If you run on a track that is less than 200m the conversion is even greater.